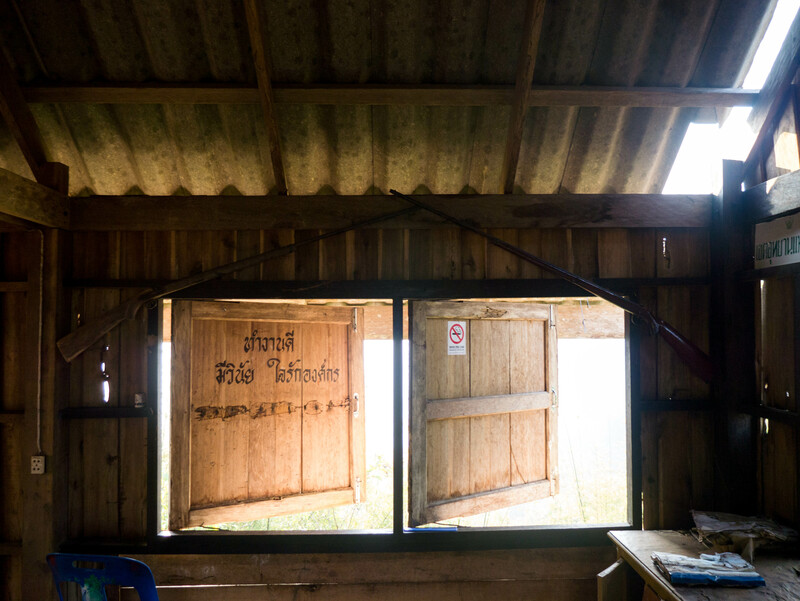 When I last wrote, Sophie and I were headed towards Ranong at the border with Myanmar in order to do a refresh of our visas. Well, in the end at least I got my visa refreshed by taking a boat to Myanmar, entering the country, leaving the country, then boating back and re-entering Thailand. Sophie on the other hand got pushed through bureaucratic hell and told she has two weeks to leave the country or start paying overstay fees. The fees aren’t bad, like $15 per day, but we’re pushing for Bangkok to be safe and considering a bus or train from Bangkok to Poi Pet at the border of Cambodia. Anyways, three days after that immigration “adventure” brings us to today, where we have crossed the 450km mark and the next “big” town, Chumphon, in our journey. Three days out of Ranong, and the riding has been pretty intense. Very pretty, but very intense. Sunrise. This is the best time of day to ride, for obvious reasons. It’s hot and muggy, but not unbearably so. Going from Ranong to Chumphon takes you across the peninsula from the Andaman Sea coast to the Gulf of Thailand. 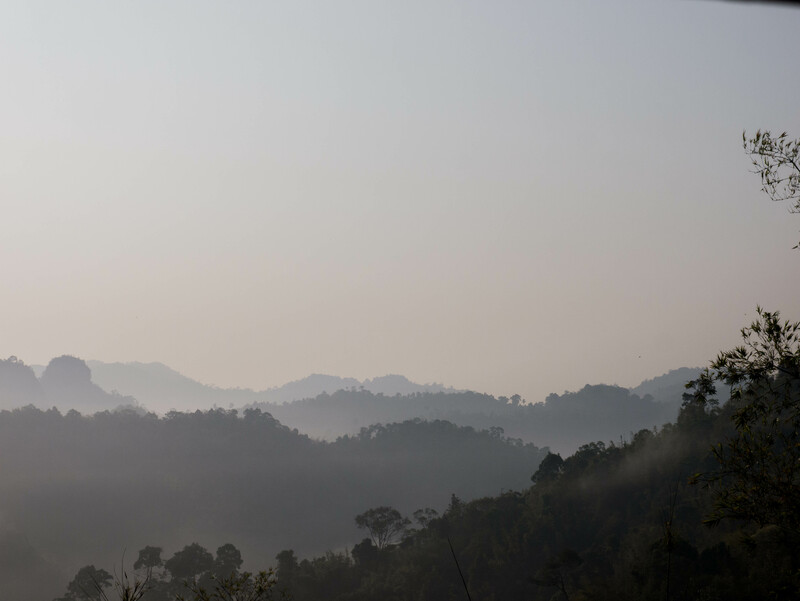 A little tired of the main highway (lots of traffic, but a huge shoulder for motorbikes and cyclists), we turned inwards to a smaller regional road that wound its way through the hills and mountains of rural Thailand. Leaving the main road for the inland. On our path, we had our trip’s first experiences with wonderful Thai hospitality. I’d heard a little bit about this on blogs, but over the last few days these become a common occurrence. One day, a motorcyclist passed and honked at me, and then 10 minutes later caught up to me and handed me a bottle of ice cold water for free. The next day, just as we were about to stop for a snack, another guy came up on a motorbike and just handed me a bunch of bananas. One night we sought refuge in a nice concrete shell of a house by the side of the road, only to be welcomed soon after by the owner of the land, her daughter, and their tiny Doberman puppy. They gave us a plate of watermelon, and invited us in for dinner. Everywhere we stop, people ask us “Where you go? !” and little children yell “Hello! Good morning!” It’s nice to be here. Top of a nasty climb. Now on to the bad. 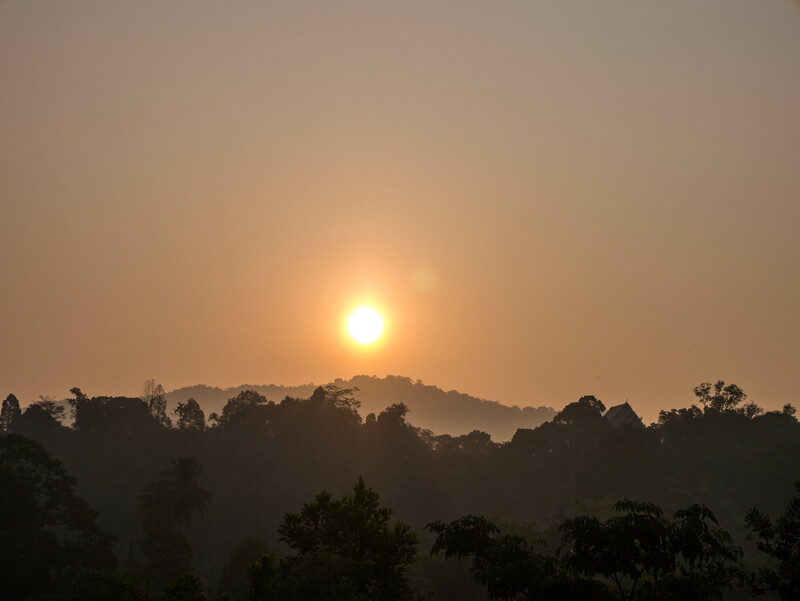 Between Ranong and Chumphon, we found our first big climbs. The first day, I took the wrong turn and we ended up doing 3-4km of pointless climbing. Then the next day brought the worst of it. I knew there was a climbing coming up, but I didn’t know that that particular climb would end up being the most ridiculous I have seen in almost three months on the road. 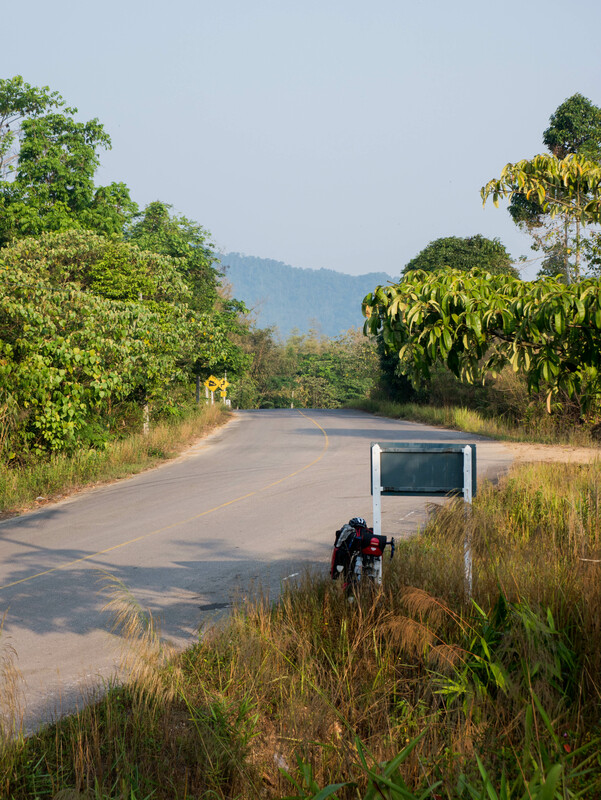 Has Thailand’s department of rural roads ever even heard of a switchback? My usual mapping tool (ridewithgps.com) says that the climb averaged between a 17-21% grade for the duration of 2km. Unrideable. Absurd. Sophie and I both ended up walking and pushing our bikes up the entire thing, screaming obscenities into the rapidly-approaching midday heat. Abandoned house at the top of the climb. 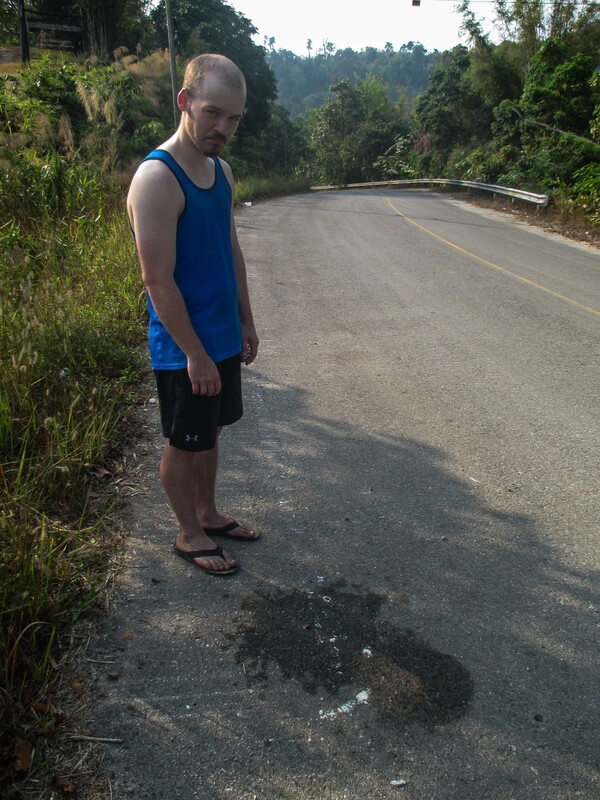 Disgusted at (sorry, this is gross) how much sweat I wrung out of my towel after the climb. At the top, there was a nice view, which you can see above. There were also about 50km left until the beach on the Gulf of Thailand. Both of us were eager to be able to rest on the beach after those two days, so we pushed on into the heat. We ended up riding until 1pm, finally collapsing, spent, on the beach enjoying our recovery meal of fried chicken, sticky rice, and bananas. But overall, I’ve greatly enjoyed my time in Thailand. The people are nice, the fried chicken is always incredible and abundantly available, and there are noodle shops and mini-marts everywhere to get cold water or ice cream. Yeah, the midday is really oppressively hot, but we usually stop by 11 to chill out and watch a rural Thai town go about its day. The market gets set up, people set up stands to sell fruit, and then eventually Sophie and I move in and buy some fried chicken. We splurged tonight and got an A/C room for $17, and that plus the fried chicken we bought has made for a nice afternoon. Did I mention that the fried chicken here is really good? Sounds like a brutal few days of riding. What an accomplishment. The people sound lovely.